For as long as I have known about wine, I have known that the Mondavi Family of Napa Valley was the standard by which all others aspired in making great Cabernet Sauvignon. So it was with high expectation and a twinge of nervous energy that I sat down with a family member, Peter Mondavi Jr. He and his brother Marc, whom I had spoken with earlier in my wine-writing days, have major roles in the Charles Krug Winery near St. Helena. Charles Krug has a long history of winemaking in Napa Valley, being the first winery to open its doors in 1861. Fast-forward to 1943 when the Mondavi family purchased the property, with Peter Sr. and Robert Mondavi jointly building the brand with Cabernet as its signature wine. In 1966, Robert opened his own winery in nearby Oakville and Peter Sr. turned to his sons Peter and Marc to carry the load of quality winemaking and marketing. Peter was in San Diego to conduct a “Vertical Tasting” of seven of his Cabernets during the recent San Diego Bay Wine & Food Festival. “I’m looking forward to sharing some of our older vintages, from our current 2006 release all the way back to 1980,” he said. I reminded him that it would be like a historic footprint of the rise of Cabernet to the grandeur that it enjoys today. “Well that may be true, but the real education will be in the tasting of the wines that have evolved over time, how the age enhances the taste so that the experience of the wines will be the best teacher,” he said. Definitely, Cab is king in the valley and it will be coming out of the Napa Valley for decades to come.” I asked him about the 2009 harvest as I heard there were issues. “The ’09 season was challenging. It was cooler than normal with a much longer growing season and heavy rains, the heaviest since 1962. We were out picking grapes the end of October.” After the teaching session, Peter asked the assembled for a show of hands as to which vintage was their favorite and it was the 1995, followed closely by the 2004. The current release also did well with its classy and opulent flavor with hints of chocolate and espresso at the finish, preceded by notes of blackberry and licorice, with 23 months in French Oak barrels. The Vintage Selection is suggested at $70. with the ’06 Yountville Cab retailing for $27. I found that the more age in the bottle, the more mineralized the taste became, such as the bottles from the ‘80s. They were also bigger wines with higher alcohol. Krug and others are now achieving more balanced flavor with lower “PH” or sugar content in the grapes, resulting in a less alcoholic wine that pairs well with fine food. It is now a sustainable practicing vineyard with sensitivity to the environment, using only natural additives. See it all at www.charleskrug.com. — San Diego Wine Company is featuring its favorite wines of the year in a tasting from 11 a.m. to 4:30 p.m. Dec. 26. There is a tasting fee of $10. For more information, call (858) 586-9463. — 3rd Corner downtown Encinitas has a Prix Fixe Menu paired with three great wines from 5 to 10 p.m. Dec. 27 for $25. Entrée is shrimp scampi over linguini. RSVP at (760) 942-2104. — Bacchus Wine Market in the Gaslamp San Diego is holding a New Years’ Eve Early Bird event from 3 to 6 p.m. Dec. 30. Sample seven premium wines. Cost is $40. 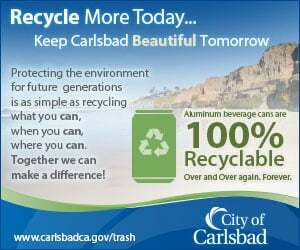 For more information, call (619) 236-0005. — The Grand Del Mar is celebrating New Year’s Eve at Amaya with a four- course dinner from 5:30 to 10:30 p.m., plus wine pairings in an elegant setting. Cost is $175 per person. RSVP at (858) 314-2727. In the larger Addison, it’s a seven-course experience from 6 to 11 p.m. Chef Bradley has his brilliant touch in every step of the way, with live entertainment in the Lobby Lounge. The cost is $300 each with wine pairings. RSVP at (858) 314-1900.